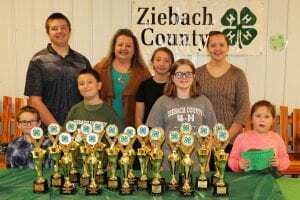 The annual Ziebach County 4H awards/recognition night was held on Friday, November 16th and 4H members, leaders, and guests enjoyed supper, awards presentations, and a slideshow created by Patty Peacock that presented pictures from the 2018 Ziebach County 4H year’s activities. Amber Donovan then spoke about her Citizenship Focus trip to Washington, DC last year. After the meal, the program opened with the Flag Salute and 4H Pledge and passing out the 4H Member record books and t-shirts. Next, Patty Peacock and Julie Thorstenson presented the awards they earned. Trophies are given for the numerous areas that kids were involved in. 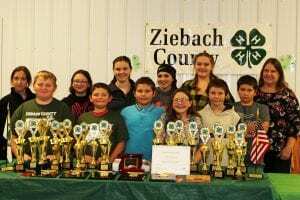 Grand Champion or Reserve Champion (much like first and second place in each division) were awarded in areas such as Photography, Foods & Nutrition, Horticulture, Shooting Sports, Hobbies, and Collections. In order to win a trophy, a 4H member must submit a completed 4H book for the year and win at least one purple in that category. Additional ribbons earned are calculated and compared between members and those with the most points earned are awarded Grand and then Reserve. In case of ties, demonstrations done or involvement in that project area is considered. Kim Bachman presented the Youth In Action plaques. To close the program, the 4H member who made the greatest improvement from the beginning of the shooting sports season to the end of the season was presented to Sierra Feickert. 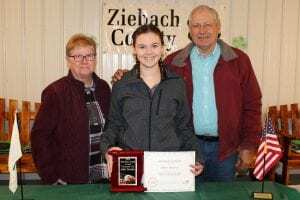 The Mercedes Lemke Plaque was presented to Amber Donovan and the 4H Leaders Assn. $250 Scholarships were awarded to Tayla Thorstenson and Amber Donovan. The remaining awards are listed by 4H member in age division and alphabetical order. Beginner 4H Division: Rio DeLaRosa-Grand Champion-Hobbies & Collections and Grand Champion-Special Foods; Bailee Donovan-Reserve Champion Foods & Nutrition, Reserve Champion-Home Env., and Reserve Champion-Visual Arts; Sierra Feickert-Grand Champion-Shooting Sports; Emma Jordan-Reserve Champion-Hobbies & Colletions; Maverick Lemke-Grand Champion-Poultry & Eggs and Grand Champion-Welding; Wyatt Lemke-Grand Champion-Foods & Nutrition, Grand Champion Horticulture, Reserve Champion-Shooting Sports, and Reserve Champion-Welding; Juell Twitte-Grand Champion-Clothing & Textiles; Minda Woodward-Grand Champion-Home Env., Grand Champion-Visual Arts, and Reserve Champion-Special Foods; and Kayli Young-Grand Champion-Rodeo. For the Junior 4H Division: Zoey DeLaRosa-Grand Champion-Foods & Nutrition, Reserve Champion-Visual Arts, Grand Champion-Clothing & Textiles, and Grand Champion-Fashion Rev. ; Kaylee Jordan-Reserve Champion-Home Env., Grand Champion-Photography, Grand Champion-Visual Arts, and Reserve Champion-Educ. Display; Alan Lemke-Reserve Champion-Poultry & Eggs, Grand Champion-Home Env., and Grand Champion-Horticulture; Dustilyn Lemke-Grand Champion-Poultry & Eggs, Reserve Champion-Foods & Nutr., and Grand Champion-Shooting Sports; and Baxter Schrempp-Grand Champion-Educational Display. In the Senior 4H Division: Brodie Bachman-Grand Champion-Visual Arts, Reserve Champion-Hobbies & Collections, Grand Champion-Child Dev., and Grand Champion-Health Project; Amber Donovan-Grand Champion-Hobbies & Collections; Erin Lemke-Grand Champion-Foods & Nutrition, Grand Champion-Home Env., and Grand Champion-Special Foods; Malory Peacock-Grand Champion-Educational Display, Grand Champion-Fashion Review, Reserve Champion-Home Env., Grand Champion-Clothing & Textiles, Reserve Champion-Child Dev., and Reserve Champion-Foods & Nutrition; and Maxwell Peacock-Grand Champion-Graphic Design, Grand Champion-Photography, and Reserve Champion-Visual Arts. State Participation plaques, for qualifying to compete in 4H at the state level in rodeo or shooting sports, were presented as well. Amber Donovan was awarded this year’s Mercedes Lemke Memorial Award. Judy and JD Lemke presented the plaque. 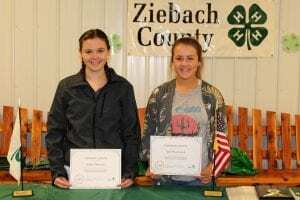 Amber Donovan (left) and Tayla Thorstenson (right) received this year’s 4H scholarships, worth $250 each. 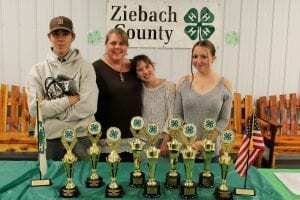 Mustangs 4H Club members pose with their awards won. Front (L-R): Casyn Gage, Rio DeLaRosa, Lexi Gage, and Gabriella DeLaRosa. Back (L-R): Maxwell Peacock, Patty Peacock-Club Leader, Zoey DeLaRosa, and Malory Peacock. Dustilyn Lemke’s awards are in the photo but she was not able to attend the event. Top Hand 4H members and their awards. (L-R) Brodie Bachman, Kim Bachman-Club Leader, Emma Jordan, and Kaylee Jordan. For state 4H rodeo, plaques went to: Kayli Young, Tayla Thorstenson, and Marlene Woodward. In the shooting sports BB gun category, plaques were given to Baxter Schrempp, Sierra Feickert (also chosen for the most improved award), Wyatt Lemke, Maverick Lemke, Michael Donovan, Minda Woodward, and Dustilyn Lemke.